These furry rodents are regulars at many backyard birdfeeders and will also attack a variety of garden targets such as young seedlings, berries, fruits, and vegetables. They even have been known to decapitate flowers such as tulips -- seemingly just for fun. Chipmunks are particularly good at unearthing bulbs, eating freshly planted seeds, and munching on maturing root crops. These rodents are smart. Given time, they'll find a way to get to their desired target. As with birds, it's best to vary your approach every so often to keep the rodents off balance. An good exclusion trick is to place a baffle on fruit tree trunks or bird feeder poles. New ″squirrel-proof″ feeders appear frequently in catalogs -- they may feature counter-weighted or electrified perches that surprise the critters when they visit the feeder. Some gardeners have had success spraying animal repellents such as cayenne pepper mix, predator urine, and commercial formulas on or around plants. Others have had short-term success using ultrasonic noisemakers or setting up separate squirrel-feeding stations to lure them away from the garden. Trapping is the surest way to remove problem rodents. 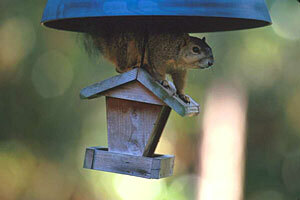 Live traps are very effective for particularly pesky squirrels or chipmunks. However, don't expect to control a whole population with trapping -- there are always more squirrels and chipmunks waiting to move in.